On January 2, 2018, the world lost a true hero in the fight for human rights, justice, government accountability, and, most recently but not least, the truth about the events of 9/11. 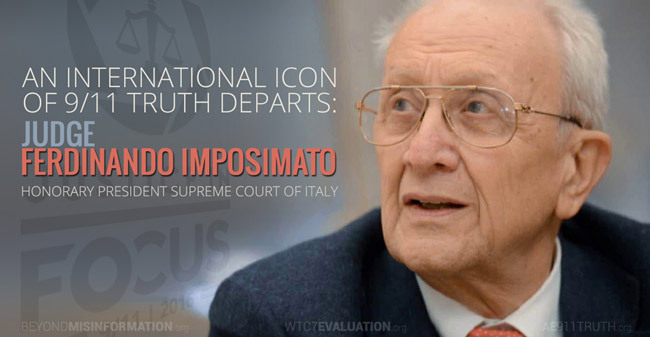 Judge Ferdinando Imposimato of Italy, honorary President of the Italian Supreme Court, died in Rome at Gemelli Policlinico, where he had been admitted to the intensive care unit on December 31, 2017. We at AE911Truth consider ourselves fortunate to have worked alongside Judge Imposimato for the cause of 9/11 Truth during his last several years, and we are extremely grateful for his dedication to our mission. . .